Forever Overhead: ToB Contest: Zombie Round! It's the Tournament of Books Contest! In the comments of THIS POST, list the books that you think will advance to the next round of the tournament AND your prediction for the overall winner of the ToB. Entries may be formatted however you like, but you must list the Title of the book you predict will advance. For each correct pick you will receive ONE point. Winner wins any one book from this year's ToB or a previous winner of the ToB. One entry per person (please). I am aware there are other similar contests. You won't be cheating on this contest if you date other contests. You are welcome to join our contest beginning with this round, but you will be at a serious disadvantage if you didn't participate in previous rounds. We will do one more round of picks for the finals on March 29th. As always, current standings are linked in the blog header. Please check the standings - if you've followed Forever Overhead on Facebook or on Twitter and you do not see that reflected in the standings, please email me at 4everoverhead@gmail.com. Leave your picks in the comments. This round does not require picking an overall winner, but feel free to pick on anyway. 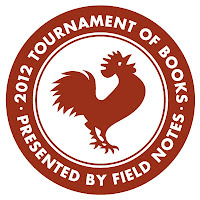 Powells.com is a sponsor of the Tournament of Books and you would be doing them (and me) a big favor if you used this link to buy any of the books in this year's tournament. All ToB books are 30% off their list price and you'll be supporting a great bookseller!